Ballarat. Refreshment and lunch stops are made during the day. On arrival in Ballarat we check into our motel for dinner. After breakfast, we travel via Melbourne to sale passing through the stunning Gippsland area. The tour continues to Bairnsdale and Lakes Entrance for dinner and our overnight stay. can see a slab hut originally built in 1872 by Pioneers and relocated from the upper Snowy River! Eastern Water Dragons together with an abundance of birdlife in their natural habitat. We explore Mallacoota and the immediate environment. View Gabo Island from Bastion Point and wander along the pristine beach beside the ocean entrance to the ‘Inlet’. The selection of luxury homes featuring mud brick construction are full of interest. We also travel towards Betka and the Quarry beaches. You will marvel at the ancient and weathered sedimentary rock formations originally part of the seabed and now forming an imposing cliff face. A picnic lunch is provided. communications bunker hidden within the forest. After breakfast we cross the border into NSW and the scenic “Sapphire Coast”. We call into Eden where we enjoy a spectacular panorama at Twofold Bay. Here we also enjoy a morning tea at Rotary Park, our lunch is at Merimbula. After breakfast we depart Batemans Bay to begin a delightful tour through the New South Wales Southern Tablelands and Budawang National Park to the historic township of Braidwood. We enjoy a morning tea stop before continuing to Canberra, arriving around midday. On our arrival we visit Parliament House for lunch in the Parliament House Café. Australia’s new Parliament House is an impressive building on the banks of Lake Burly Griffin. The impressive structure is sculptured in the shape of the original hill and the interior is made entirely of Australian timbers. We tour the Great Hall where one of the original four copies of the Magna Carta is on display. We may have the opportunity to watch Parliament in session. This evening your dinner is at your own cost and has been left free for your choice of venue. Enjoy a meal in-house at your accommodation or you may wish to visit the RSL Club which adjoins the building. After breakfast, we visit the popular annual Canberra Floriade. This incredible event has become one of the world’s major flower festivals. 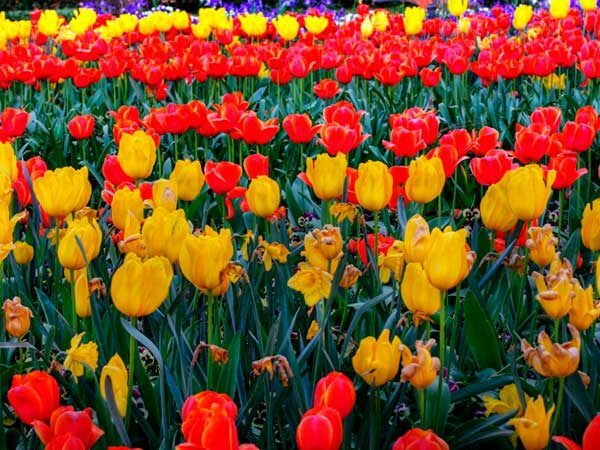 The amazing array of springtime flowers and colours of thousands of tulips are the best in the Southern Hemisphere! Queen Elizabeth herself was impressed by the displays during her visit to the Floriade event in 2011. After visiting some Canberra’s special highlights, we travel to the impressive Australian War Museum for a tour which will include the moving Last Post Ceremony. This evening enjoy dinner and overnight at our accommodation. After breakfast we travel to Cooma, where you will see the Avenue of Flags which was established to honour workers from 27 countries who helped to complete the Great Snowy Mountains project. The Snowy Memorial was erected to the memory of the 121 people who lost their lives while working on the Snowy Mountain Scheme and in Cooma Park there is a statue of A.B. Patterson’s ‘Man from Snowy River’. Drive along the Snowy Mountain Highway through scenery to Adaminaby. During the construction of the huge Snowy Mountain Scheme in the 1950’s, Adaminaby was flooded to create Lake Eucumbene and the town was moved to a new site. After lunch enter the stunning Kosciuszko National Park. We travel to Tumut for our overnight stay and dinner. After breakfast we depart Tumut and travel via the Snowy Mountain Highway to join the Hume Highway. Our tour travels through the town of Tarcutta, Holbrook and on to Albury we cross back into Victoria then to Benalla for lunch. After lunch we tour to Bendigo for our overnight stay and dinner. After breakfast, we depart Bendigo and travel through Victoria’s Mid-Eastern area. We continue to Nhill before arriving at Bordertown. We continue to Adelaide via the Great Eastern Freeway arriving approximately 6pm.